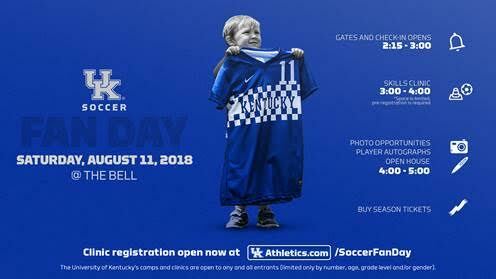 LEXINGTON, Ky. – The Kentucky men’s and women’s soccer teams will hold their annual fan day on Saturday, August 11 for all members of the Big Blue Nation to come out and meet the teams, as well as participate in a free skills clinic. Fan Day will begin at 3 p.m. ET at the Wendell & Vickie Bell Soccer Complex with greetings from head coaches Johan Cedergren and Ian Carry and a skills clinic for kids. An open house, as well as autograph session with players and coaches from both teams will be part of the program following the on-field demonstrations. Fans will have an opportunity to tour both locker rooms, peek a day in the lives of UK student-athletes with first-hand looks at the coach’s gameday offices and team lounge – as well as some of the other perks the state-of-the-art facility offers. The skills challenge is open to all kids in 1st – 6th grades. Space is limited; participants should pre-register at UKAthletics.com/SoccerFanDay. Check-in for the skills challenge will begin at 2:15pm. The University of Kentucky’s camps and clinics are open to any and all entrants (limited only by number, age, grade level and/or gender). Season tickets will be available for purchase at fan day and are available online here or by calling the UK Ticket Office at (800) 928-2287. Season tickets include admission to all 20 men’s and women’s soccer home games, a limited-edition scarf, and UK decal. Single-match tickets for all matches can also be purchased online through Ticketmaster.com/UKSoccer or by calling Ticketmaster at (800) 745-3000. The men’s soccer slate of matches opens on Friday, Aug. 24 as part of a three-match home stand. The women’s season gets underway on Friday night, Aug. 17 against SIUE in the opening day of the 2018 UK Athletics calendar season. 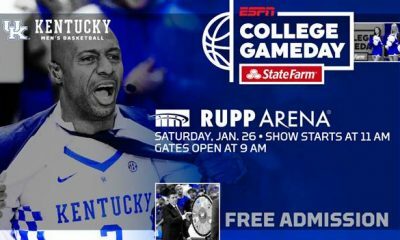 Fans who prefer printed tickets can log in to their “My UK Account” from a non-mobile device to access printable PDF tickets.